I've recently made a decision to USE some of my older, retired Designer Series Papers (DSP), rather than hording it endlessly for the proverbial rainy day. So, when I recently needed some purple-toned paper to make a box and card, I immediately thought of the pretty Enchanté DSP (from the Summer 2007|2008 Stampin' Up! Mini Catalogue). Accessories: Enchanté Designer Series Paper (retired), True Black Luxe Satin Ribbon (Papertrey Ink), Clear Rhinestones (Kaiser), Eyelet Border punch, SNAIL adhesive and mini glue dots. The beautiful beads are handmade glass lampwork lentils by Terry of Silverfish Designs on Etsy. 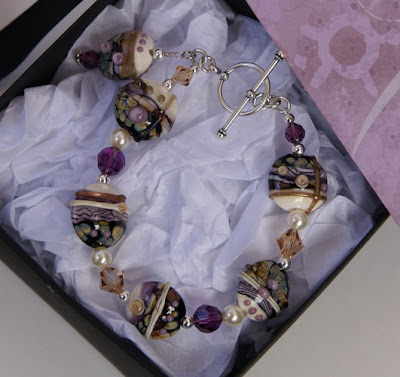 I really love the unusual shapes, patterns and colours that Terry works into her beads. They are truly unique! 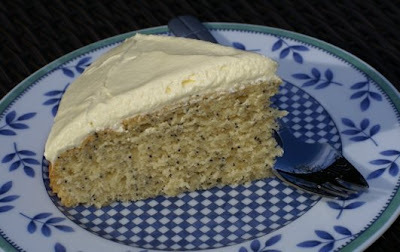 It is an Orange Poppyseed cake, and for a packet mix it tastes pretty good! Better go bring in the washing before it gets damp again (and yes, by 2 in the afternoon, it is almost damp again...BRING ON SPRING!!!!!!!!! :-). WOW Sam - that bracelet is gorgeous - and so is the box! I've never seen that DP - before my time with SU. When are you going to open your own Etsy store for your jewellery?!?!? Gorgeous Bracelet Sam and box and card to match. I am sure the recipient will be extremely happy! You are a tricky one, beading, home made gift box and a cake...making the rest of us look bad. I did manage to burn a packet cake this week I will let you know! lol! Your card & box are just gorgeous (cake & braclett too I might add) great job using the old dsp, something I struggle to do because you just cant buy it again!!! That's a funny looking lemon cake (though sounds divine) I have enchante left too - it was very yummy DSP. Hi Sam, I see you've been busy. Lucky is the lady who's on the receiving end of this beautiful bracelet. Love those beads.... Isn't glass fascinating? The textures are remarkable and every one a wee bit different from the next. I made one in red, it was less metallic, but of the same model xD It's beautiful, really! Ahhhhhh Hello, can I be your new best friend?!!! LOVE the bracelet! You are just soooo talented Sam! And if that cake tasted as good as it looks...You can visit me anytime!! I'm not normally a big purple fan but I really like what you've done with the card and box Sam. And the bracelet is gorgeous...and the cake...you are too clever! And I second the "Bring on Spring" remark!! Winter is yukky!